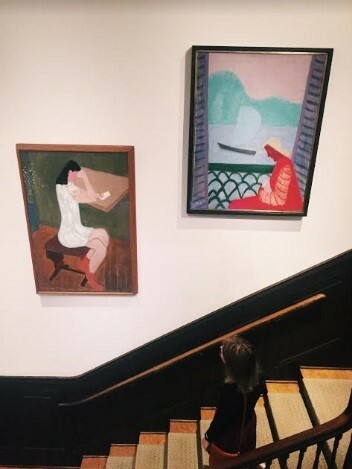 Leaving the oak-paneled entry hall of the Phillips’s home and ascending up the main staircase leads to two paintings that appear to be in conversation. Both are works by American artist Milton Avery (1885-1965), and both contemplate similar visual practice. One first encounters Girl Writing, which has visibly brushed earth tones and a closely focused figure. The perspective is unclear, yet seemingly from below, falling into step with the viewer peering upward at the disorienting scene; it has an aura of a false, created space. Continuing up the staircase, there is a second woman seemingly in tandem with the first—they are aligned at eye level. These paintings have a compelling contrast between dimensions, in some areas three dimensional, in others, entirely flat. Conveyed through blocks of color, there is a certain strength asserted through deliberate, unapologetic flatness. These two women are portrayed in mirroring profiles, and are lost in deep thought. Both are participating in literary acts: one is writing, the second reading. The second woman is March on the Balcony, and though similar in stature to Girl Writing, this painting differs in its bold, less naturalistic hues that are not contained to the surroundings—March, the artist’s daughter, is rendered in shades of yellow and scarlet. Here, the brushstrokes are minimized, giving the effect of pure, flat fields of color that stray from the naturalistic. This leads the viewer to stop, to consider the scene as a whole, and to seek understanding through the eyes of the artist. This through-the-window perspective is not uncommon, most recognizably seen in paintings by Matisse; however, Avery’s approach differs. While the view through the window may seem to be the focus of the painting, with a pale blue sail commanding the central space, the attention appears to be more so given to the interior, as the eye is instead drawn to the downward-gazing figure of March. She exists in a more three-dimensional space, a reality that looks out upon an imagined state of pastel waves. While March on the Balcony holds a clear perspective point, Girl Writing leaves the viewer disoriented; unlike the window scene, there is no clear division between the three-dimensional and the flat. Instead, there is a sense of displacement, of searching for logical space in a painting devoid of it. Gravity dissipates, leaving the viewer with only color and form to interpret Avery’s created reality.